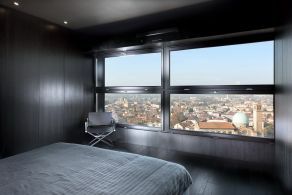 L’Attico a Padova is situated in the highest building in the centre of Padua, a city famous throughout the world for Saint Anthony’s Basilica, whose cupola can be seen from one of the property’s terraces, while the Scrovegni chapel is visible from the other side. The property is currently being used for commercial purposes but could be converted for residential use. The historic centre, with its bars, restaurants and shops is within easy reach, 5 minutes on foot. The communal areas of the building, dating from the 1960s, were restored in 2010, while the loft and its appliances were fully renovated in 2015. The property, with 3 large underground box garages, is well connected both with the centre and the main roads: the A4 and A13 motorways are 10 minutes away by car (7 and 8 km respectively). This makes it possible to get to Venice (50 km) in half an hour and Verona (80 km) in around 50 minutes, while Bologna (120 km) is just over an hour away by car. The nearest airports are Venice Marco Polo (45 km), a little over half an hour away by car and Treviso (65 km) at around 45 minutes away. 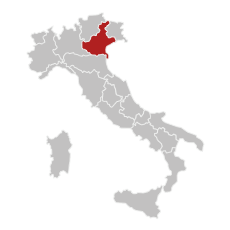 The high-speed train station, which connects the city with Milan in two hours and Rome in a little over 3 hours, is 5 minutes away on foot. From the triple underground garage there is access to the palazzo, where there is a beautiful hallway with concierge and security. 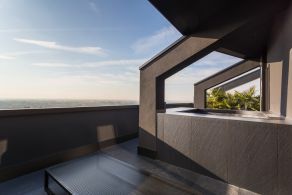 On the 20th and final floor, the property can be reached by a lift, with an electronic key providing exclusive access to the inside of the apartment. 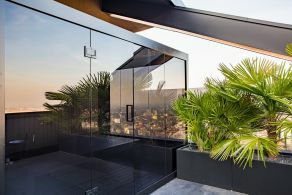 The building, with a total surface area of 340 sq.m, has been fully restored, with large windows with electric blinds providing a bright aspect in all areas of the apartment, which contrasts with the dark tonal decor carefully created by the current owner. The furniture is minimalist, elegant and linear: an example of contemporary design and excellence made in Italy, such as the natural stone table in the living area or the ‘one off’ leather sofa in the main living room. Indoors, the current layout is intended to maximise the comfort and usability of the space, guaranteeing adequate size with three large areas, which would be perfect as bedrooms; the studio, the three bathrooms and the living area comprising a hidden kitchen, and a very large living room, plus a storeroom. The loft, built in 2015, is in perfect condition and is one of a kind in Padua: there is no other place as high, or with comparable views or similar features. 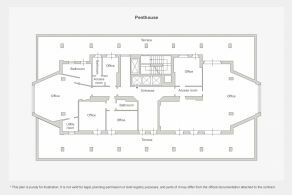 The apartment benefits from home automation which controls the window fixtures, the heating and the burglar alarm. The loft features two enormous terraces: the first, of 146 sq.m, faces south-west and the other, of 133 sq.m, faces north-east. Both are furnished with outdoor furniture which matches the indoors and with spa/fitness elements for moments of relaxation with breathtaking views. Finally, the property benefits from a triple garage in the underground car park. 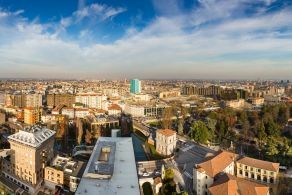 Due to its features, the building would be perfect for residential use or as an impressive office, and, thanks to its unique location, is one of the most appealing properties in the Paduan skyline. Characteristics: Located in Northern Italy, Veneto is one of the most famous and appreciated destinations, thanks to its varied territory where you can find high mountains, historic cities and a crystal-clear sea. When we speak about Veneto it is impossible not to mention Venice, a unique city, visited every year by thousands of tourists from around the world, which together with other sites in the region (Verona, Vicenza, the Botanical Garden of Padua and the Belluno Dolomites) is included in the "list of world heritage sites" of the U.N.E.S.C.O. In this multi-faceted region we also find bathing areas that, thanks to the clean sea and the presence of quality services for years deserve the Blue Flag of the FEE (Foundation for Environmental Education): San Michele al Tagliamento-Bibione, Caorle, Eraclea-Eraclea, Jesolo, Cavallino, and Venice-Lido. 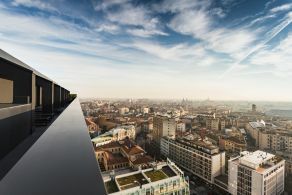 The climate is varied as its territory: mild on the Adriatic coast and with cool summers and cold snowy winters in mountainous areas of the Dolomites. Property offer: Veneto luxury apartments in Venice, Verona and Padua, important antique villas (also to be renovated) with characteristic properties and even of receptive use in mountainous areas of Cortina d'Ampezzo, Arabba, San Vito di Cadore and Selva di Cadore, on the sea at Jesolo and Venice and on Lake Garda.